The in basket: Bob Arper asks if the county or state hase “decided to eliminate the merge lane that was originally on northbound Ridgetop Boulevard where the Waaga Way westbound exit intersects. The in basket: Ernest Behrle has an idea for how the Navy can help compensate Kitsap County folks for whatever environmental damage results from the new pier it wants to build at the Trident base.. There are stop signs on each side of the tracks, requiring vehicles to stop. “I know the Navy was looking for some way to pay this area back for the damage that will be caused by adding another pier at Bangor,” Ernest said. “One thing they could do is to work with the railroad to put in a drop arm to stop car traffic if a train would actually be on the tracks. The whole purpose of the tracks is for benefit of the sub-base and the Navy. “Westgate is used by a lot of Navy personnel going in and out of the Bangor gate,” he said. The out basket: The news coverage I’ve read suggests that Kitsap has much larger fish to fry in seeking mitigation for the pier project, mostly of a shoreline improvement nature. Big Beef Creek and Port Gamble are mentioned. County commissioners also are trying to head off plans to spend the estimated $15 million in mitigation money on the Jefferson County side of Hood Canal. I asked county public works about chipping out enough to improve the Westgate railroad crossing. Doug Bear of Public Works said the money to mitigate the new pier’s impacts isn’t available for road projects. There has been other money available for this kind of project, and two Central Kitsap RR crossing recently have benefited. “The railroad crossings are managed by the Puget Sound and Pacific Railroad Company,” said County Engineer Jon Brand, “and are under the jurisdiction of the Washington State Utilities and Transportation Commission. The county received a federal Railway/Highway Crossing Program grant in 2002 for mechanical cross arms at the Seabeck Highway and Newberry Hill crossings and worked with the railroad for those improvements. “There was also an application filed for Westgate but grant funds were not secured for this location,” Jon said. The in basket: Charelaine Hampton and Mike McDermott both say they’ve seen drivers who are used to turning left from Myhre Road in Silverdale to go downhill to Costco, Petsmart and the other stores in that area pulling a U-turn just past the barrier the county put there to prevent those left turns. Those drivers then come back and turn right legally into the access. But in the meantime, their U-turns create an accident hazard, both said. Charelaine says the U-turners use the exit from Harrison Hospital’s Silverdale location and endanger drivers coming out that exit. She sees it almost weekly, when she goes to the hospital for a regular meeting, she said. Mike described what he saw one day in October. “As I turned from Ridgetop onto Myhre there were two cars in front of me. The first one pulled into the center lane before the barrier so they could still make the left turn. The other car went just past the barrier and went into the bus stop on the right side of the road and made a U-turn right in the middle of Myhre to get back to the lane down to Costco. “Obviously, this deterrent to turning left near Petsmart is going to cause more problems if this is what people are going to do,” he said. “All people have to do is continue down Ridgetop another block to Mickleberry and turn right,” he said. The out basket: I would hope that the problem would abate in time as more drivers learn those left turns are now forbidden and plan an alternate route. I was surprised to discover that just a couple hundred yards further ahead on Myhre is another left turn that still is open that leads down to Costco with hardly any greater travel time, though getting back to Petsmart would require a little more extra time. Until then, I thought it would be necessary to drive all the way down to the next traffic signal on Myhre. And by continuing straight on Ridgetop, as Mike suggested, a driver not only can turn right at Mickelberry, but has two even earlier right turn opportunities to get to where the now-forbidden left turn used to take them. Asked about the U-turns and other driver reactions to the barrier, Kitsap County Traffic Engineer Jeff Shea chose to reiterate the reasons the barrier went up in the first place. “The Sheriff’s Department presented me with nine collision reports for about a one-year period (2010) at this location,” he said. ‘They asked if anything could be done to reduce the collision frequency. “…Most of the collisions were the result of a motorist either turning left out of the approach or turning left into the approach. The logical counter-measure was to restrict the vehicle movements to right-in right-out only. “Knowing that a sign alone would not preclude motorists from turning left, we decided to put the curbing in. In addition to the sign and curbing, flexible delineators (posts) were installed and the yellow striping was reconfigured to an 18-inch solid line, which state law prohibits motorists from crossing. “There are two (other) convenient accesses to this commercial property, one further north on Myhre or eastbound motorists on Ridgetop Blvd can stay on Ridgetop and make the first right turn. 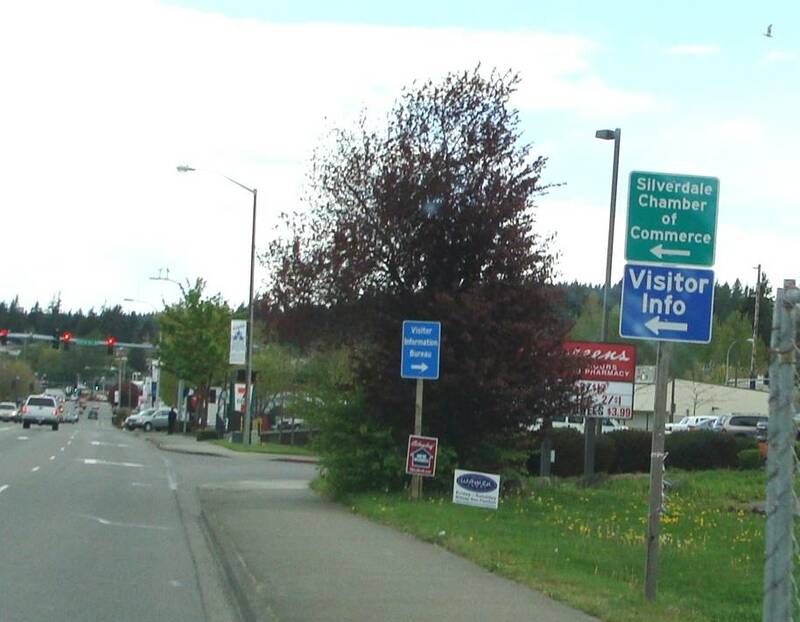 The in basket: A reader who went only by “A Kitsap County Driver” in an October e-mail asked, “Could you possibly persuade the county to install ‘signal when exiting’ signs on the roundabout on Anderson Hill (Road in Silverdale)? “Most drivers signal when entering (although that is the only direction you can go) and not when exiting (or leave their blinkers on the entire way around). “The county’s addition of the roundabout has been a great traffic revision and it flows much better – however it would flow just a bit smoother with some instructions for drivers,” the e-mail said. “Signage just seems to be a forgotten last step in this project. “When Bainbridge installed a roundabout, I distinctly remember several well-marked signs. The out basket: I drive that roundabout just enough to know that it’s not round at all, but flat on the south side. It probably serves mostly straight-ahead traffic in both directions on Anderson Hill Road except when Central Kitsap Junior High is beginning or ending the day’s classes. For westbound traffic, it barely requires a driver to turn or slow down if a car isn’t coming around from the other direction. I don’t know whether signaling by drivers would help, and the county isn’t inclined to post signs requiring it. Jeff Shea, Kitsap County traffic engineer, says, “While signaling when exiting a roundabout is a courteous thing for drivers to do, I am not aware of any law that requires it. The only required sign for a roundabout is the Yield sign that requires traffic entering a roundabout to give right of way to all traffic in the roundabout. “I don’t know of an application where we’ve placed a sign at any other intersection that applies to using a turn signal, and don’t plan to place one at this intersection either,” Jeff said.. The in basket: Ralph Gribbin and Gary Blankenship are hoping the new traffic pattern in Manette with the opening of its new bridge will be smoothed with some changes on the short block of Pitt Avenue between Harkins and East 11th Street. Ralph would go further. “Ever since the old bridge was closed, Manette traffic has had to go straight through on Harkins to Pitt, stop, turn right on Pitt for one short block and stop at 11th Street before turning left onto it,” he wrote. “Leaving those two stop signs where they are stops the smooth flow of traffic from the bridge to 11th and up to Perry and Trenton avenues. “Removing those two stop signs, placing a Yield sign on westbound 11th just before Pitt, and a stop sign on eastbound 11th just before Pitt would make this the thoroughfare that should exist in that area. “The same basic layout has existed at Trenton Avenue and 11th for years without any problem,” he said. The out basket: I drove around there and it does have all the earmarks of a bottleneck, with little room for anything very large to make the turn if there is oncoming traffic. The city of Bremerton is taking a wait-and-see approach to this, says Gunnar Fridriksson of the city engineers office, to see what drivers do naturally. There will be some changes made in that area, probably next year, but they’re not intended to help the flow to and from the bridge. “We will be going from the west end of (East) 11th Street, east as far as the money will allow us. We originally were trying to make it to Perry Avenue, but with the funding received, are trying to at least make it to Scott, but it may just be to Pitt. “It should be a good complement to the redone Whitey Domstad viewscape,” he said. What does ‘RV disposal fee’ dispose of? The in basket: Michael Drouin e-mailed to say,”Upon reviewing the tab renewal form for our RV, we noticed that there is now a ‘RV disposal fee’. What is this fee? “Is it for disposing of derelict RVs abandoned on public property? “Is it for demolishing RVs after their usable life has ended? “Is it another fee that Tim Eyman should file a voter initiative about a new tax? “Is it another fee for which the payer receives no benefit? The out basket: Michael’s final guess is closest to the truth, as he probably suspects. Brad Benfield of the state Department of Licensing says, “The $3 RV disposal fee, also known as the recreational vehicle sanitary facilities fee, is used by the Department of Transportation for the construction, maintenance and operation of recreational vehicle sanitary disposal systems at safety rest stations across our state. “This fee is collected on registration transactions for campers, motor homes and travel trailers. I don’t know when this particular fee started but it certainly is not a new fee. I do know that it was increased to the current $3 on Sept. 1, 1996. Prior to this, it was $1. “I suspect this fee has been around since 1980, because that is when the law authorizing the account the money is deposited in was created,” he said. That sounds like the fund now may be tapped for other roadway purposes and I’m awaiting word from the Department of Transportation as to whether it has taken advantage of the newly granted possibility. Do owners of damaged roadside equipment seek compensation? The out basket: I checked with three of the entities about which Jack asked – Kitsap County, the state Department of Transportation and Puget Sound Energy. All said they make a concerted effort to collect damages from drivers or others who damage their property. Dorothy Bracken of Puget Sound Energy says her company goes to small claims court, if necessary. “We do pursue vigorously anyone who damages our equipment,” she said. “We work with the responding police agency and acquire the police report. We’ll pursue the owner of the car, but prefer to pursue the driver. Someone may be in for a large bill or insurance claim following Monday’s car/pole accident near Manchester that knocked power out for 12 hours in the area and required replacement of the pole. Scott Wilson of the Kitsap County Sheriff’s Office said a driver who had been sent home from work due to illness lost consciousness at the wheel and hit the pole in his truck. He wasn’t badly hurt, but between the costly pole and all the man hours for restoring the pole and traffic control, PSE and the county could be looking for thousands of dollars in compensation. The driver also may get a $550 ticket for negligent driving, Scott said. As an aside, Dorothy says broken mains from excavation are the most common type of damage on the natural gas side of the company. She said state law allows PSE to recover triple damages for such a mishap. That assumes the offender didn’t call the “Call before you Dig” phone line to get the utilities in the area marked by paint on the ground or street, or did call but the maps the markers used were in error and didn’t show anything where the line was damaged. The in basket: Mike Malane of Tony’s Pizza on Kitsap Way in Bremerton and Yvonne Dean both have asked about what we can expect for traffic control at the new Winco store access on Kitsap Way. Mike’s interest is obvious, as his business is across the highway. Yvonne says, “Kitsap Way is a very busy street and starting with Auto Center Way going toward downtown Bremerton there is a light just after the highway overpass to let (northbound) vehicles enter Kitsap Way then there is a light on Shorewood where the fire station is located and then there is this new road just across from American Legion Post 149. Kitsap Way is has four lanes of traffic with a turn lane in the center. How is this going to work? Is there going to be another light? The out basket: Gunnar Fridriksson of the city of Bremerton street engineers says, there will be a new signal at the new intersection on Kitsap Way, the principal entrance for the Bay Vista Development and Winco. The in basket: I was curious about the beige fabric that was laid at the base of the cliffs the state just reinforced on Highway 3 between Gorst and Bremerton, and in the nearby ditches. It didn’t look like the typical erosion ccntrol material I’ve seen elsewhere. So I asked about it. protect the soil from pounding rain that would disturb the soil surface and cause erosion,” he said. “The matting helps keep the water clean before it flows into the bay.